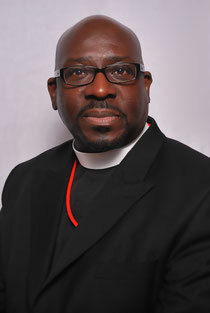 Superintendent Reginald E. Miller Sr.
Elder Reginald Miller is a native of Fort Worth, Texas. While a freshman in high school, he received the Lord Jesus as his personal Savior and soon thereafter he received the baptism of the Holy Ghost under the leadership of Supt. R. C. Williams, Sr. Friendly Temple C.O.G.I.C. in Fort Worth, Texas. God began to unveil his gifts and calling as a musician and teacher. Elder Miller accepted his call to the preaching ministry during his senior year in high school. Many souls were blessed through the anointing that rest upon his life. In 1983, Superintendent Williams confirmed his call by issuing Minister's License through the Church of God in Christ. In 1984, he transitioned to the Dallas area after graduating from ITT Technical Institute to accept employment as a Engineering Technician. Elder Miller then joined the Faith Kingdom C.O.G.I.C. of Dallas Texas, under the pastoral leadership of Supt. Charles E. Craig, where he was captivated by the lovely and gifted Sister Victoria Long and not many days later the two were joined as one in Holy Matrimony. Through this union were birthed their treasure and joy (3) children. Krystle, Candace, and Reginald II, all who serve faithfully in the work of the Lord. While engaging with the vision of Supt. Craig, Elder Miller availed in many areas of the ministry. He learned the precepts of Christ and set his heart on being a servant leader. (Mark 10:44 And whosoever of you will be the chiefest, shall be servant of all.) On June 29, 1991, he was ordained as an Elder of the Church of God in Christ and soon thereafter Supt. Craig appointed Elder Miller as his Assistant Pastor where he faithfully served for 17 years. In February 2009 under the recommendation of Supt. C. Craig, Bishop J. N. Haynes appointed Elder Reginald E. Miller, Sr. as Pastor of the (formally) Phagan Addition Church of God in Christ of Terrell, Texas. Under the leadership of this visionary, God's purpose's and plans have continued to manifest. The new identity (name change) for the church was declared in the year 2010 from the book of 2 Peter 2:9 "But ye are a CHOSEN GENERATION..." Within three years of his pastoral appointment, Pastor Miller has served under a "Joshua" anointing, and has lead God's people from a .9 acre, 2400 sq. ft. facility into the, 6.5 acre campus, place of promise. The present main sanctuary/facility is measured at 19000 sq. ft. and the chapel is a 3400 sq. ft. facility. God has added many souls into the kingdom and through this great man of God. Pastor Miller thoroughly believes it is the Lord who "orders our steps" and he encourages all to trust our Father. Our motto is "Preaching, Teaching, and Praying, that no soul will be left behind.